A founder of the Impressionist movement, Renoir was used to criticism. His early work was subject to much disapproval but he also acquired a fan base for his original and somewhat modern paintings. Dance at le Moulin de la Galette drew mixed reactions from viewers but today it is one of the most celebrated works from the Impressionist period. While many critics praised Renoir´s technique of fluid brush strokes and flickered light, others felt that this canvas was a somewhat blurred impression of the scene. Renoir´s aim was to express the true spirit of the dance: each couple, their movement, and who they were. However, critics such as Theodore Duret, Alberto Martini, and John Rewald acknowledged this effort and believed Renoir perfectly captured the atmosphere of this Sunday afternoon dance. Renoir´s early career, like the other Impressionists, was subject to much criticism. As with many of his paintings, Dance at le Moulin de la Galette´s use of light created a sense of vitality that did not obey the rules of the Salon. Focusing on classical rather than contemporary styles, the Salon did not appreciate dance hall depictions such as this but this was of no great importance to Renoir as he wanted to portray life as he knew it and always did so with a touch of glamor. Georges Rivière, a writer and good friend of Renoir´s at this time who also features in Dance at le Moulin de la Galette, wrote a review of the canvas in the journal L'Iimpressionniste which accompanied its exhibition. He described Dance at le Moulin de la Galette as a "page of history, a precious and strictly accurate portrayal of Parisian life". 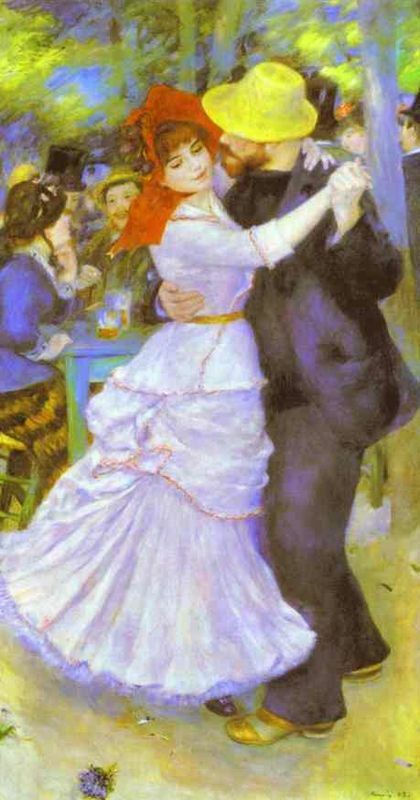 Many see Dance at le Moulin de la Galette as a true representation of Renoirs technique. This canvas captures the spirit of the scene with joyfulness and passion and some critics believe it is the greatest illustration of both Montmartre and Paris. Yet one critic, Januszczak, feels that Dance at le Moulin de la Galette is far from a happy painting. Januszczak questions the females expressions and claims they do not portray joy. Januszczak says that drawing frowning lips and dark eyes was a way for Renoir to express his negative feelings about the women. He says "When you stare into these faces, any of his women's faces, you sense a slow, dreamy sadness. The black eyes are trained on infinity. All his women have this sadness in their eyes as if they too know they are living a dream." In claiming that the womens eyes are filled with sadness rather than joy, Januszczak does not consider other features in the womens faces that indicate discontent. It is possible that the womens mouths are distinct not only in Dance at le Moulin de la Galette but in Renoirs entire collection of dancing couple paintings: Dance at Bougival (1883), Dance in the City (1883), and Dance in the Country (1883). Analyzing each of these paintings, it appears that all the women's mouths frown except for the woman featured in Dance in the Country, his future wife. This shift in facial expression may be a symbol of Renoirs love for his wife-to-be and dissatisfaction with the other women. Dance at le Moulin de la Galette was a depiction of one of Renoirs favorite subjects - entertainment - and it was clear that he took great pleasure in painting dancehalls, concerts, and cafes. He was extremely talented in capturing the essence of modern life in his work and was of the opinion that "life was a perpetual holiday". Like Manet and other inspirational painters, Renoir treated all of his works with equal beauty and he may well be the only artist never to have produced a sad painting. According to some, such enthusiasm makes Renoir the most accessible and adored painter in the world.